TV’s Story is one of the interactive installation artworks in the series ‘Interactive House Objects’. It revolves around the recollections of a television’s thoughts on the surroundings and people who spend their days staring at her as she’s moved around the house from one corner to another. The audience will get to know her, as well as her hidden secrets and stories. This interactive art reveals human experiences and behaviors towards a familiar object. Unlike new objects, the shabbiness of ‘used’ objects reflects traces of memories and stories, as well as the behaviors and habits of humans in different ages and groups, from the time they begin to interact with the work until they leave. Aside of the content, another intriguing aspect of this work is the interaction audiences have with the art, which reflects their background, experiences, maturity, and interactive behavior toward deviation from familiarity. The TV’s thoughts on surrounding things, expressed though the screen and subtitles, change to reflect the places where she currently is or is moving to. 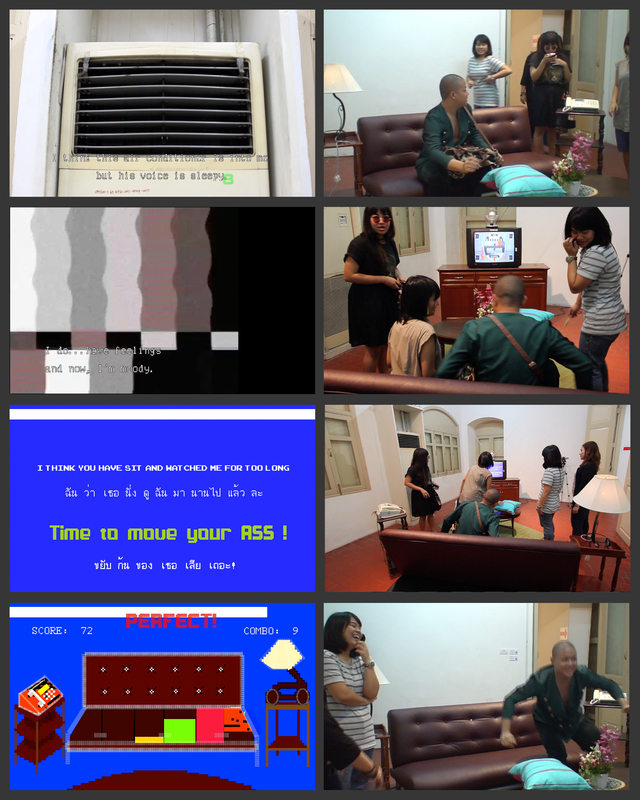 For example, her thoughts when she stayed in the Art Centre of Silpakorn University were about the days she had hung out in the gallery’s store room, the installation settings she saw, and her surrounding objects, which she referred as her ‘old friends,’ such as an air-conditioner, a table, a landline phone, and doors. The artwork has been developed since its first show to become a more stable and friendly final version. Like in a dancing game, the participants have to bounce on the couch to follow the rectangles that appear on the TV. These rectangles have 3 different colors to indicate the timing of hitting the target spots, which relate to point values. “Yellow” means too early, “green” means the spot was hit at the right time to earn the highest score, and “red” means time is about to run out. In this scene there is also a landline phone and a lamp. Occasionally, when indicate, the phone needs to be picked up and the lamp needs to be turned on and off. At the end of the scene, the participants who reach 350 points or above in the game receive a call from the TV. She calls to say congratulations and how much she appreciates to the participants in both English and Thai. Aspiration. “3 อาชีพเกิดใหม่ที่น่าจับตามอง: Interactive Artist, Experiential Designer และ Creative Technologist.” Aspiration, Jan 2019. https://bit.ly/2FtbKaz.